I do not like sweet food for the first 18 years in my life because my teeth was get used to spicy and savory foods. Sweet desserts were here but less appealing to me compared with real Sichuan style hot food. However after living in Guangdong province for around 5 years, I fall in love with sweet dessert slowly especially some of the Hong Kong style desserts, baked buns and cookies. The cities might looks similar from the appearance, but the foods are so different from the history background and geographic position. Before start making those yummy buns at home, there are some key ingredients. To make the perfect custard filling, custard powder is necessary. It is firstly imported by some bakery stores in Hong Kong and now becomes a popular baking ingredient in Mainland China too. 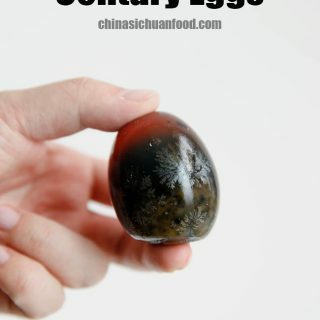 It can increase the milk aroma and add slightly yellow color to the filling. 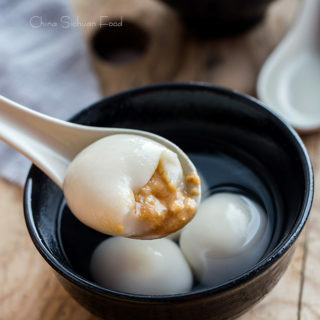 Wheat starch is the main ingredient for another famous dim sum dessert-Har Gow. The reason why it is used to replace flour is because it is almost transparent, which further give the filling a perfect yellow color. Start with the dough firstly. 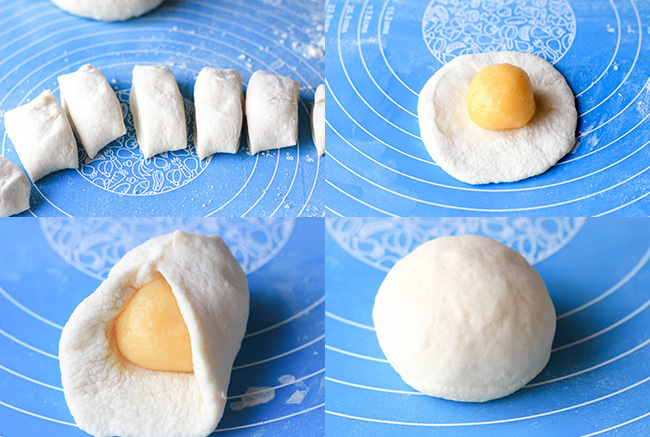 If you are not familiar with how to make a dough for Chinese buns, check Chinese steamed bun for some detailed guide. And then the custard filling. In a small pot, combine custard powder, wheat starch and sugar together.Heat over low heat and then add milk. Keep stirring until well mixed.Stir in beaten egg slowly and keep stirring during the process. Add butter in. Heat until well mixed. You can taste the filling for some adjustment if necessary at this step. Remove off heat and turn the filling over and over again until it can form a smooth ball and everything is well incorporated. The left picture is before turning with a spatula and the right picture is after. There should be no particles in the filling dough. 1. It is quite necessary to shape the filling into balls before assembling the bun. This is make the process much easier especially for starters. 2. To get a uniform wrapper after sealed completely, the edges of the wrapper should be slightly thinner than the center. 3. 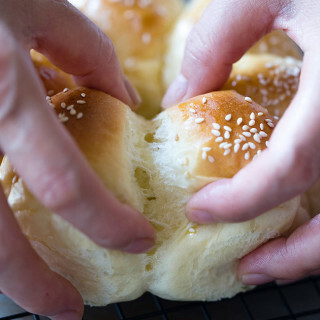 After seal the buns, turn them over gently and then shape again for a better round shape. 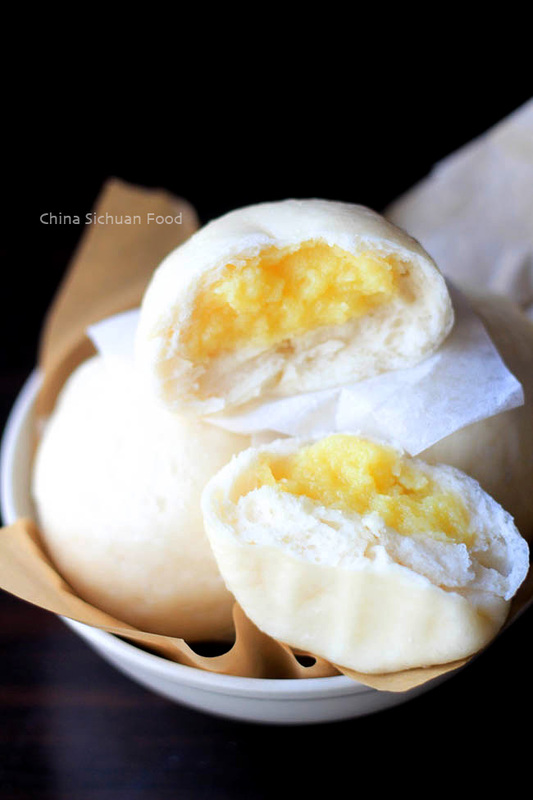 Dim Sum custard buns with strong milk and yolk aroma. In a small pot, combine custard powder, wheat starch and sugar together. Heat over low heat and then add milk. Keep stirring until well mixed. Stir in beaten egg slowly and keep stirring during the process. Add butter in. Heat until well mixed. Remove off heat and turn the filling over and over again until it can form a smooth ball and everything is well incorporated. Set aside to cool down and then place the custard filling in fridge for at least 1 hour (depending on the temperature)or until hardened. So you can shape the fillings easily. Add sugar and yeast to the warm water. Wait for around 10 minutes until the yeast is well activated. Mix other ingredients for the dough with the warm yeast water prepared in the previous step. Grasp everything together and knead until the dough becomes smooth and elastic. Brush some oil on a large bowl and transfer the dough for the proofing. Wait for 2-3 hours until the dough is doubled in size. Take one portion out, press down slightly and then roll to a around wrappers around 8 to 10 cm in diameter. Make the edges thinner than the center. Place on portion of the filling on the round wrapper and then seal completely. Repeat the process to finish all the buns. Set up the steamer and let the buns reset for around 10 to 15 minutes with lid covered. Steam on high heat for around 15 minute to 20 minutes. Turn off the fire, wait for 5 minutes before uncovering and enjoying. The Nutrition Facts is based on each single bun. And super yummy too Acyhoz especially for the filling part. It does not need too much time and taste really great. 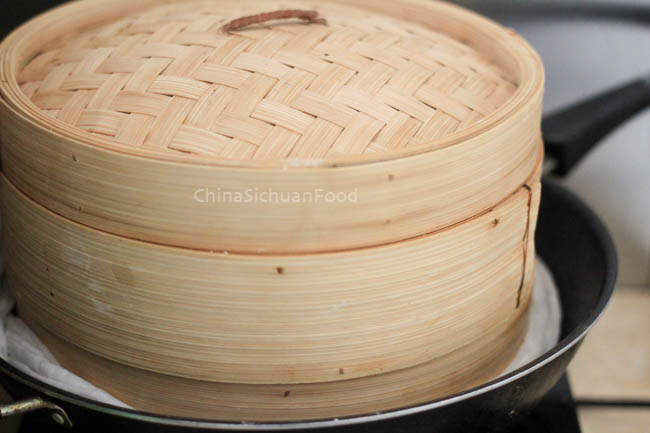 Hello – can you also let me know how you use the bamboo steamer? i got a set like that and has been wondering as how to use it with what pan? looks like you have some kind of cloth in the pan too? 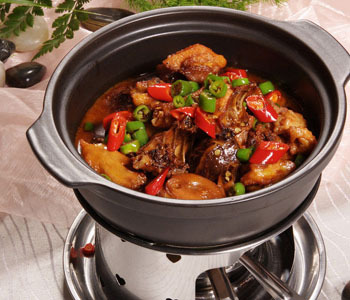 You should choose a wok or deep pan with similar size of your steam. Add water in the wok. And then use a long wet cloth or gauze to cover the bottom of the steamer, just like the picture shows. This can avoid air leakage and shorten the steaming process. I love dim sum. I am a big yum cha fan, but have never seen these delicious looking buns on any of the carts. are they freezer friendly? I love these pau and the recipe looks easy enough to follow. pictures look GREAT! Yes, you can store them for sure after steaming and cooling down. Place in refrigerator for up to one week with plastic wrapper covered. And then re-steaming before the next serving. Never seen such buns before today, simply awesome! Thanks Sylvie for stopping by and leaving such a sweet comment. 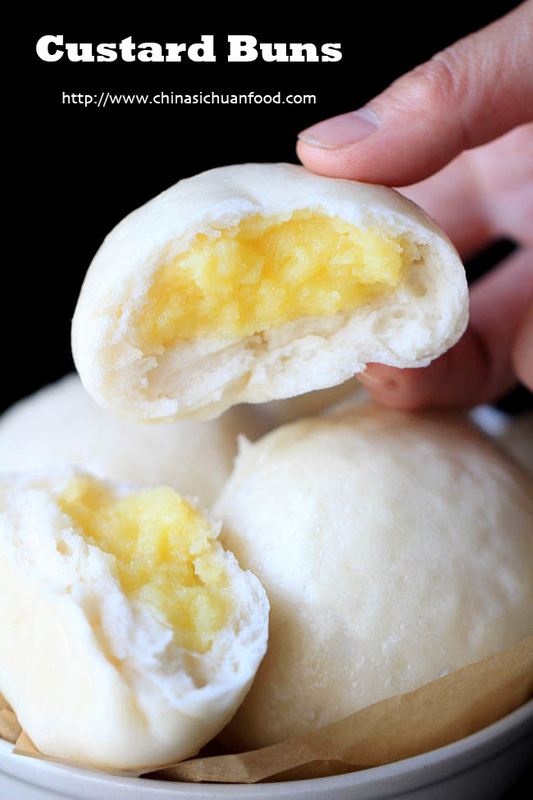 This custard bun has a strong milky flavor and is one of my favorite dim sum buns. I don’t have any wheat starch on hand. 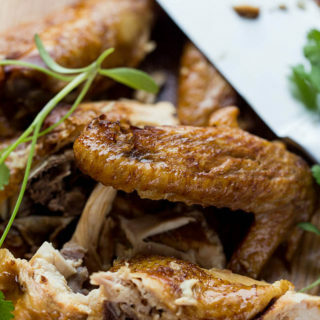 Can i substitute wheat starch with cornstarch? Hi there, yes you can use cornstarch to replace wheat starch. However the filling may not be so crystal and colorful. 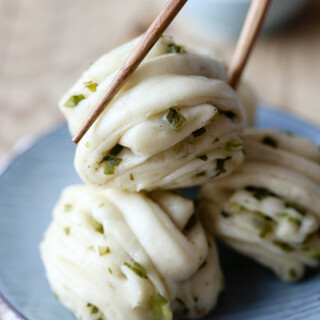 It is a very basic Chinese steamed bun dough and oil is not required. If the dough is too dry, you can slightly add more water. I have never tried with oil in the dough. But can you tell me how it turns out? I agree with the original poster – the dough was a bit dry. The second time I made the dough, I added about 10 ml grape seed oil and that made an enormous difference in the pliancy and tenderness of the baozi. Also, I added a pinch of salt and 2.5 ml vanilla extract into the custard filling to enhance the flavor of the custard. It came out wonderfully. Thank you for the recipe! Hello, I was wondering if there’s any substitute for the custard powder? There is no perfect for custard powder but you can skip it. In the US Jello instant vanilla pudding powder is a similar product. Not identical, but I have substituted it in the past for other British and Canadian custard desserts with no bad results (will taste a little sweeter and more vanilla). hope this can help the original poster. I’m from Hong Kong and I love this dessert! I never make it at home but you make it look so easy. Thanks for sharing the recipe! Thank you Audrey! Happy cooking ahead. I love these bum. Can you teach me how to make the baked version also? 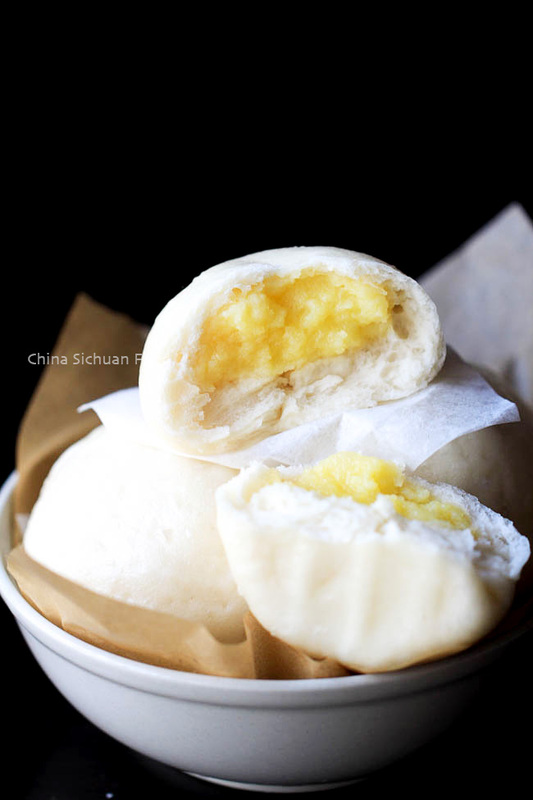 I never tried a baked custard bun, but we have a baked char siu bao. Go head this link https://chinasichuanfood.com/char-siu-bao-baked-buns-recipe/ for the direction. Not sure if you would be able to see my comment, but you can make the bake version. Find your favourite dinner roll recipe and just add the filling into each dinner roll then you get your baked version of it. Thank you for the wheat starch advice. I have made this with another recipe that failed because the custard remained liquidy. I will make this soon. 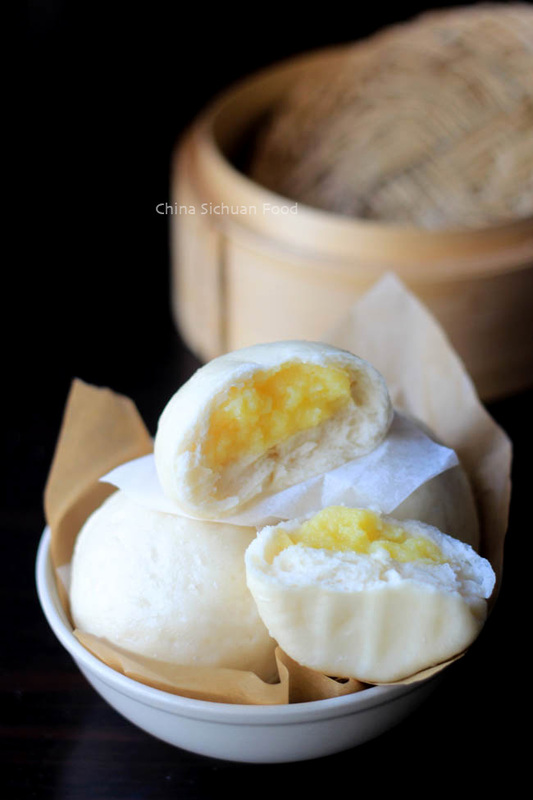 To make the custard filling, you can also refer to this post: https://chinasichuanfood.com/snow-skin-mooncake-video-recipe-with-custard-filling/. I shared a video showing the process. I seem to have the opposite problem. My custard was way too hard it was very sad. 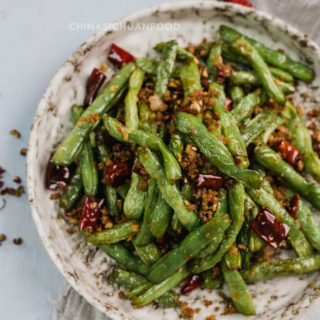 I’m very excited to try making these and the sweet red bean buns soon! I noticed the recipe for the dough is slightly different for each one though. Is it alright to use the same kind of dough for both flavors? If so, which of the two would you suggest? Basically the dough is quite similar with each other. But sometimes, I add some extra flavor like milk or sugar and etc to match with the filling. Cake flower bun will be much fluffy while all purpose flour bun will be chewier. You can choose either one and change the fillings. Hi Elaine! I ate these once and their filling was very creamy, almost runny. 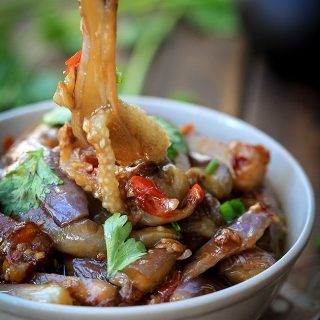 Is there a way to make this recipe “runny”? By the way, thank you so much for this recipe! These buns are really delicious! The running one is another filling. This one is sweet while the other one is salty. I will introduce that “running” version in following posts. it’s my second time trying to interpret this recipe to ingredients available in Finland (no wheat starch or custard powder, I substituted for both with potato starch and vanilla), but my main problem is the dough. It turns out really thick and chewy though I add a little more water than stated in your recipe. i suppose the difference is in the flour, though I’m using extra fine wheat flour. It’s frustrating, because the buns are impossible to shape and seal, and they keep splitting open, because the dough isn’t sticky enough. What do you suggest I should do? 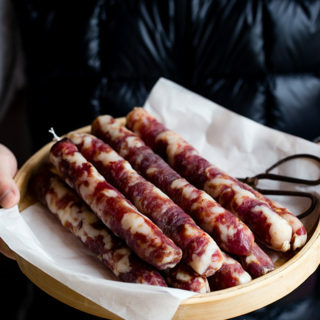 I’d love to succeed with these, because the recipe is fantastic and they taste delicious! Thank you for your effort and wonderful recipe! I guess the problem is the ratio of flour and water. The gluten content in the flour influences how much water will be needed. I suggest you change the current flour, using flour with less gluten for example cake flour. Or you will need to adjust the amount of water, adding more to make the dough soft enough. You can send me images over instagram. Great recipe! the taste is so close to the real thing! My only problem was the custard came out way too thick instead of being “smooshy” it’s like boiled egg consistency. Any ideas why? This milk yolk filling is thick but not flowing. Are you referring the salted egg flowing filling? They are two different kinds made from different ingredients. 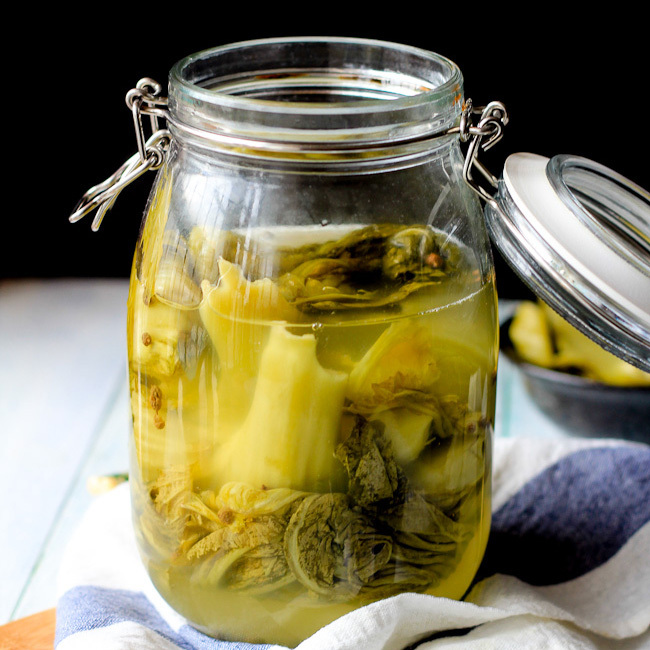 Thank you for share your recipes! they are just great! I made this buns yesterday and they were amazing! 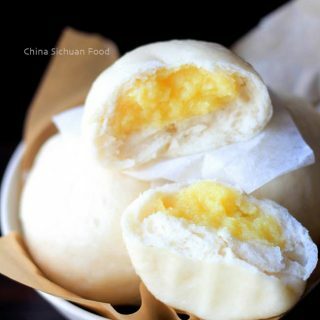 Its one of the things I miss when I was working in Bangkok and used to visit chinatown and eat this delicious egg custard buns. No I can make it myself! Thanks Renata for such a wonderful feedback! You are so talented! Lots of people get problems at the first several attempts. Happy cooking and wish you a great year. Do you have any video tutorials online? I post several video recipes. You can find them on my youtube channel. This might be a still question, but is there a substitute for instant yeast? This looks amazing by the way! Instant yeast can be replaced by dry yeast or pre-fermented laomian. Why are you need to avoid instant yeast? I’ve already gone to the store this week, so i’m avoiding having to go again. Thanks for the recipe! Ok, good point! But replacing yeast with other agency may make the process much complex. So I guess you need to wait until the next store shopping. Happy cooking! I live in Zhuhai, China. Where can I buy custard powder? Will I be able to find it in the supermarket or from the people who sell dried goods in the wet market? If so, what are the characters I should show them when I want to buy it? I don’t speak Chinese! Get it from Taobao or online market selling baking ingredients. Search 吉士粉. Thanks for sharing the recipe! I tried making these and the dough came out a bit soft and sticky after it proofed after 2 hours. When I steamed them, it came out “flat” and parts of the buns still had a raw dough texture. I steamed it for 20 minutes. Perhaps I used too much liquid in the dough? I believe your dough is over proofed. It becomes quite warm now and you need to shorten the proofing time. And the buns are not well steamed if it is still flat with a raw dough texture. How do you set up your steamer? My custard wasn’t like the picture you showed. After mixing everything, it was still liquidy and didn’t get thick after I took it off the heat and began folding it till it made a ball. Did I do something wrong? I added everything like the instructions said and mixed it with a spatula on low heat. Sorry that I cannot figure out what’s wrong based on your description. It might be caused by the wrong amount of ingredients or lack of heating. I have shown the process of making custard filling in a video when making snow skin mooncakes. I hope this can be helpful. I had the same problem. After 2 attempts following the ingredients i halved the liquids and doubled the solids with the same runny result…in stumped. hello! I had felt the same thing but after making sure everything is smooth and it won’t curdle up I increased the heat incrementally until it started to solidify a bit and then it would clump up really quickly so be careful! just turn up the heat a tiny bit until it’s more like medium low, not low low, mine form after I decided to increase the heat. Becareful because the starches cook really quickly and dry up fast! Hi Elaine, I had all the ingredients requested (cake flour is Pillsbury and wheat starch from asian market) and I just finished steaming them. My buns are not white but murky brownish grey, while the color before steaming was quite beautiful white dough. I did not have problem sealing or with the texture of the dough while forming. The buns have a bit of glossy uneven bumps. Even when I checked after 15 minutes they already developed this greyish and glossy unevenness. Do you think the heat is too high? Or is there not enough steam? I realized I ran out of water at some point unknown. It tastes fine but it didn’t turn out fluffy. Do you think it’s because my dough didn’t rise enough? I notice that my instant yeast is “quick” acting, and by the time I let it activate for 10 minutes it turned into a mountain of foam and barely any liquid left, although my dough did not turn out dry or hard to form at all. I noticed that it didn’t rise as much as yours did though. Or do you think it’s because of kneading. I noticed that it was very easy to shape into a log so I only kneaded it for about a minute or so, not so much force or anything, because it was so elastic and nice. I was my bun was soft and light instead of chewy and dry-ish. Any troubleshoot help would be very kind of you. I will try this again soon. It isn’t that hard after all. Along with all the information you provided, I believe the problem might be your yeast. Do you cook with it usually? How it performs with other recipes? If there is insufficient water in the dough, it absorbs water from the filling and make the filling dry and hard even the filling itself is properly cooked. In addition, 1 minute kneading is not enough for fluffy steamed buns. The gluten network is not well formed. Do you wait for the water to come to a boil first before placing the steamer over the water? No, place the steamer with cold water.